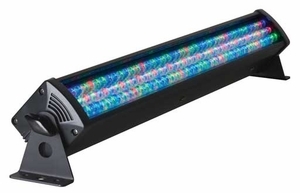 This fixture uses LEDs rated at 100,000 hours with a maximum power draw of 30W. DMX addressing may also be changed by the unit�s 4-button LED display. There is no duty cycle on the Mega Bar 50RGB RC, plus users can �daisy-chain� the power from one unit to the next with the built-in IEC power Ins/Outs. � Weight: 3 lbs. / 1.5 kg.